Purma Plast Pvt. Ltd., based in Kolkata, West Bengal, India is a well established organization engaged in offering Sprinkler Pipes, Double Union Ball Valve, Mini Sprinklers, Drip Irrigation System, HDPE Pipes, Duct Pipes and allied products. Marketed under the brand name Purma, our products have been designed and manufactured in conformity with the industry norms and quality guidelines, hence, integrated with flawlessness. Since our establishment in the year 1997, we have been growing at a more than satisfactory rate and we are currently aiming to spread our business further. 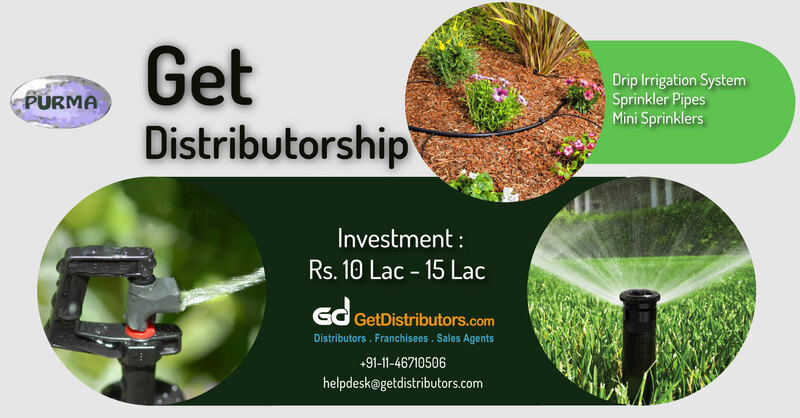 Hence, we are willing to get associated with region level distributors who are willing to aid us in our diversification plans across India. It is a great opportunity for those who wish to gain a foothold in this sector. Our annual sale is between Rs. 50.00 Cr – Rs. 55.00 Cr.